The Daughters of Mary Help of Christians of CMY Province, particularly the Sisters who are in Cambodia, gathered together to make their year-end recollection at the Don Bosco Teuk Thla, Provincial House. The Sisters were helped to spend the day in silence and prayer with a meaningful reflection on “our response to Mother General’s invitation to be “Pilgrims of Mercy” (CL 956). It was indeed a day of silence with the Lord in order to make an inward journey, reflecting on one’s personal experience of receiving mercy and one’s response to the challenge of being a sign of mercy, of compassion and tenderness towards others. 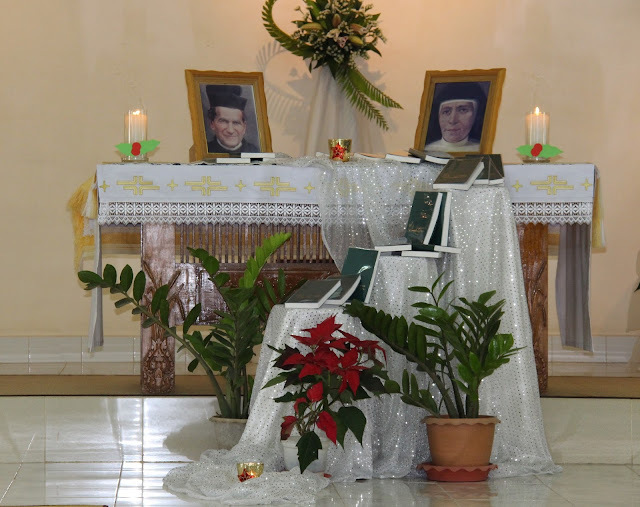 The day culminated with the celebration of the Consignment of the Renewed FMA Constitutions, which is our rule of life, our way to sanctity: the best gift, which is dearest to our hearts, was received today from Sr. Jessica Salvaña, our Provincial. The words of Don Bosco resounds loud and clear to everybody Daughter of Mary Help of Christians, “If you have loved me in the past, continue to love me in the future by the exact observance of our Constitutions”! Yes, we welcome in a new way, the call to revive our fidelity to the life-plan that Don Bosco traced out for us in the Constitutions. We commit ourselves to continue to deepen and assimilate its contents in a truly-vital way.